Unlimited Internet for 4 apps of your choice + 5GB high speed internet. Only RM 30 for 30 days. No contract. Over 100+ apps to choose from. YouTube? Instagram? Facebook? BiGo? We have it! 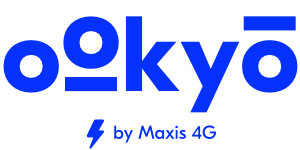 Enjoy fast speeds with widest coverage on Maxis 4G network. Works for 3G too! Want a new number? Port in your existing number? You can do both! Pay using Online Banking, Credit or Debit card.